Given to you by Phinis Gestor as part of the quest Conjuration Ritual Spell. Summons an unbound Dremora for 999 seconds. 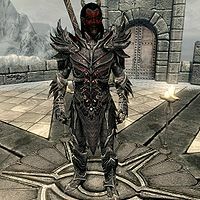 Summon Unbound Dremora is a Conjuration spell that summons an unbound Dremora. It can only be cast in one location, atop the Hall of Attainment in the College of Winterhold, and only during the Conjuration Ritual Spell quest. Summon Unbound Dremora for 999 seconds. Other summons will not be dispelled when you cast this spell. This page was last modified on 26 March 2014, at 05:59.